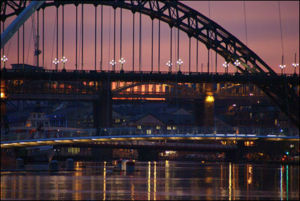 The River Tyne is formed by the confluence of the rivers North Tyne and South Tyne at Warden, near Hexham, Northumberland, in north-east England, and flows eastwards past the city of Newcastle upon Tyne and through the former industrial heartland of the Tyneside conurbation before entering the North Sea between Tynemouth and South Shields. It is best known for the industry that grew up on its banks from the early modern period, principally shipbuilding, chemicals manufacture, and the mining and export of coal. Coal was mined and shipped on a small scale from the medieval period, becoming an increasingly capitalised industry from the early seventeenth century. The presence of large supplies of cheap coal boosted other industries, notably glass, chemicals, iron smelting and founding, and, from the 1840s, iron ship building. But coal was predominant (the river is hymned as "the coaly Tyne"), millions of tons being exported each year at the river's peak. By the early nineteenth century the state of the river was impeding trade: it was shallow and shoaly, with low tide and droughts often holding up colliers (coal carrying vessels) for weeks on end; one contemporary, invited to comment on the river, described it as "a curs'd horse-pond". Newcastle Corporation held the rights to the river, and, as well as preventing development by other riverside communities, and drawing a rich income from tolls, did little to improve the navigation. Change only came once a combination of commercial and municipal interests had wrested sovereignty of the river away from Newcastle in 1850, vesting it in an independent body, the Tyne Improvement Commission. The TIC appointed engineer John F. Ure (who had improved the River Clyde in Glasgow), who drew up a major scheme for dredging and straightening the course of river for 18 miles and creating coal export docks. Shoals were dredged, rocky outcrops blasted away, the river bed deepened, piers constructed at the mouth, and the 18th century Tyne Bridge in Newcastle was demolished and replaced by a hydraulic swing bridge. The TIC constructed the Northumberland and Albert Edward docks on the north bank of the Tyne to facilitate coal export; but these were eclipsed by the huge Tyne Dock, built on the south bank by the North Eastern Railway Company, which held a regional monopoly on coal traffic. Heavy industry dominated the lower Tyne until the late nineteenth century, but from the 1980s onwards has virtually disappeared, although ship repair and conversion yards are still in operation and North Shields has a fishing fleet. The chemical industry faded in the late 19th century; mining and shipbuilding in the second half of the 20th. Since the 1980s the river has seen various efforts at urban regeneration (of the kind pioneered in Baltimore, Maryland), involving the erection of houses and flats with river views, an art gallery, a major concert hall, prestigious business premises, restaurants, pubs, bars, cafes and nightclubs, catering for a new leisure culture. The River North Tyne rises at Deadwater, on the Anglo-Scottish border, flowing sout-eastwards past Kielder and into Kielder Water, the largest man-made reservoir in Europe, formed in the 1970s by damming the North Tyne near Falstone, Northumberland. Issuing from the reservoir, the river flows past the small market town of Bellingham and the Roman cavalry fort at Chesters, where Hadrian's Wall crossed the river on a bridge whose abutments are still visible, before joining the South Tyne at Warden. The River South Tyne rises (as Black Burn) on Cross Fell, Cumberland, within a mile of the springs of two other major northern rivers - the River Tees and the River Eden. It flows northwards through Alston, the highest market town in England, turning eastwards near Haltwhistle before meeting the North Tyne at Warden. This page was last modified on 13 July 2016, at 13:35.